This 2005 visit to Braulio’s & Familia marked a return, albeit, temporarily by Charlie to our group. More significantly, it was the debut of new member, Mike from Yonkers. And as I recall, the company was more memorable than the meal. 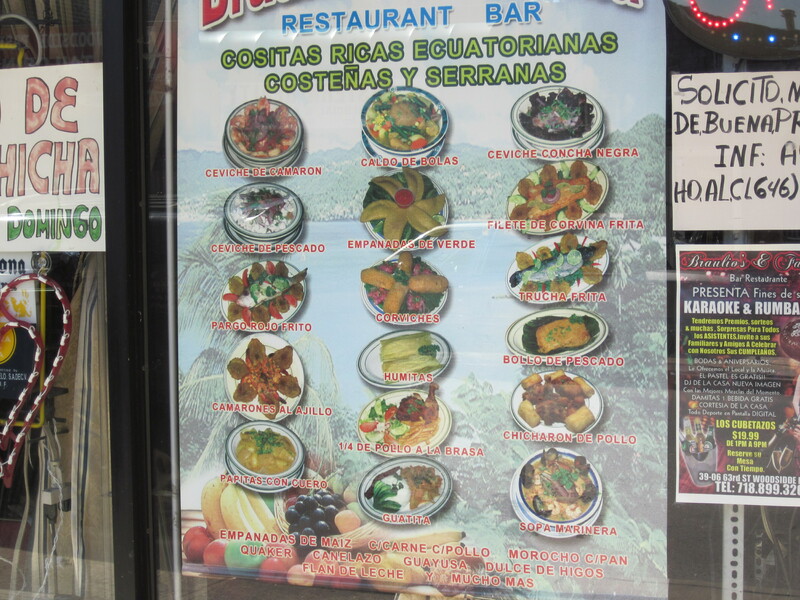 Was Gerry usurped when Zio choose Braulio’s & Famlia, the Ecuadorian restaurant, as our most recent destination? Or was there a leak among the participants to aide Zio in his choice. The facts show that there was no crime committed. A couple of months back Gerry had chosen an Ecuadorian restaurant in Portchester, an increasingly multi-ethnic suburb in Westchester. But his pick was waylaid by circumstances beyond anyone’s control: a wall collapsed on the West Side Highway and Gerry’s knee buckled under the pain of the knife; he had surgery on it the day before. Thinking he might be a food hero and limp courageously to the table, he did not postpone our dinner. But even as devoted Gerry is to our cause, the percodan he was taking to alleviate the pain would not only take away the pain, it would numb his senses, including the all important sense of taste. So, regrettably, his unique yet remote Portchester selection was nixed. Zio’s selection came next and, as he always does, he researched the internet studiously, narrowing his choices between Braulio’s and an Indian restaurant in Richmond Hill , Queens . The pick was Braulio’s, located in Woodside, a block from the shadow of the elevated number 7 train, a neighborhood so ripe with a variety of inexpensive ethnic restaurants that traveling to Portchester would be folly. Though Rick was excused from joining us, we were most happy to welcome Charlie back, who made the trek from Pennsylvania . Our host, Senor Braulio, was on hand to make sure we were comfortable and if he could be of any help with the menu. We always appreciate assistance from the waiters or owners who might guide us in properly selecting the restaurant’s absolute authentic cuisine and Senor Braulio was more than happy to do so. So, instead of poring over the impressive and extensive menu ourselves, we gladly let him order for the table. Both Peru and Ecuador are renowned for their ceviche and we previously experienced Peruvian ceviche at the excellent La Pollada de Laura in Corona two years ago. Now was our chance to sample the Ecuadorian version. To accommodate our extended familia of six, Senor Braulio had the kitchen prepare a custom-made, mixed seafood ceviche. Dried hominy corn kernels, crackers, a spicy yellow pepper garlic sauce and bread that intentionally or not, was stale, was brought to our table as accompaniments to our ceviche. We, however, are an impatient group and began munching on the accompaniments—even the stale bread. Finally the big bowl of ceviche arrived brimming with seafood in a marinade. Unlike the clear marinade of Peru, this marinade was green. There was octopus, shrimp, fish, and what is known as “black clam.” I asked Senor Braulio about the black clam and it wasn’t that the clam belly was black, just the shell. Since there were no shells to be seen, we took his word on this. The ceviche was tangy with lime and vinegar, the green color coming from the extremely generous amount of cilantro tossed in. The seafood was “cooked” perfectly in the marinade; nothing tough or suspicious tasting or smelling. As we waited for our meat platter, Senor Braulio pulled down a big screen and turned his many televisions on to EcuaTV, the television station of Ecuador . He came over to our table and apologetically exclaimed that there was a big soccer match on and hoped we wouldn’t mind, which of course we did not. It was Barcelona (not the Spanish city) vs. Nacional, two Ecuadorian club teams. 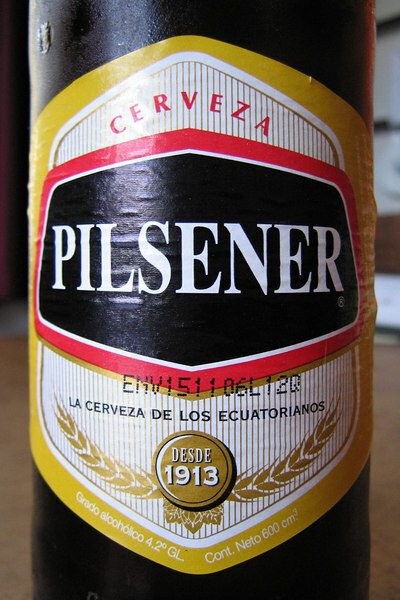 The restaurant soon was full with groups of men, large bottles of Pilsener, Ecuodorian beer in front of them, watching the game with comparable zeal to our watching a Sunday NFL game. Soon the huge meat platter appeared; a variety of grilled, seasoned meats, beef, pork, chicken, and sausage along with steamed hominy, green fried plantains, and a very pleasant green salad in a cilantro-flavored vinaigrette. Senor Braulio estimated properly and there was more than enough for the six of us. The meats and the accompaniments were perfectly fine, but what was missing was variety. By ordering familia-style we were not able to sample the curiously-named “ball soup” or the Ecuadorian fried fish, or the rice with black clams, or the tripe with potato, just to name some of the menu’s interesting offerings. In retrospect, opting for the easy route and having Senor Braulio order was a mistake. Joining us to help devour the food was a potentially new member to our group, Mike from Yonkers . Mike from Yonkers displayed proper passion for our venture, but raised a few eyebrows within our circle when he expressed concern that there might be more food coming after the gigantic meat platter. 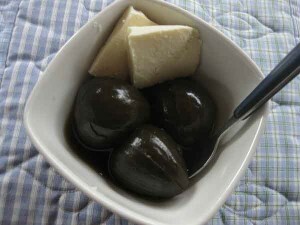 He quickly realized his error—the promise of more food should never be cause for concern—and knew better than to refuse a few bites of the dessert of figs and cheese. There’s always room for some figs and cheese. 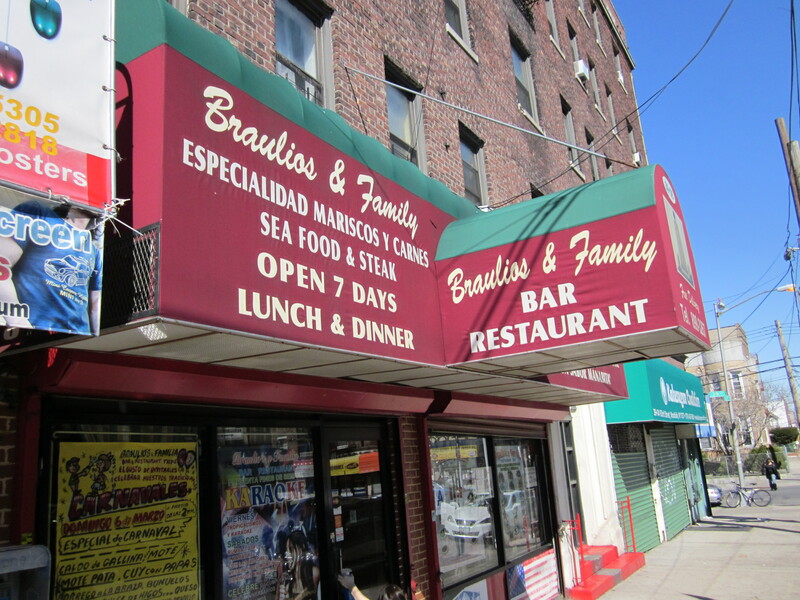 On a recent visit to, I passed Braulio’s & Familia. They have prospered since our 2005 visit and on the take out menu I noticed that they now have karaoke on the weekends and that the ball soup is still available. Their menu also claimed a website but when I tried it at home, it came up blank. Charlie has not returned to the group since our visit to Braulio’s & Familia, though Mike from Yonkers has become a mainstay. You will read much more about him in the posts to come here on the Adventures of Chow City segment of Fried Neck Bones…and Some Home Fries.